Established as a papally chartered graduate and research center, The Catholic University of America officially opened as an institution of higher education on Nov. 13, 1889. The first discussion about a national Catholic university came up at a meeting of U.S. bishops — the Second Plenary Council of Baltimore in 1866. On Jan. 26, 1885, a committee appointed by the Third Plenary Council of Baltimore chose the name The Catholic University of America. New York and Philadelphia were considered as possible sites for the university, but the nation's capital, with its national symbolism and importance as a political center, ultimately was selected. Land was purchased adjacent to the grounds of the Soldiers' Home, which had been built for Civil War veterans. 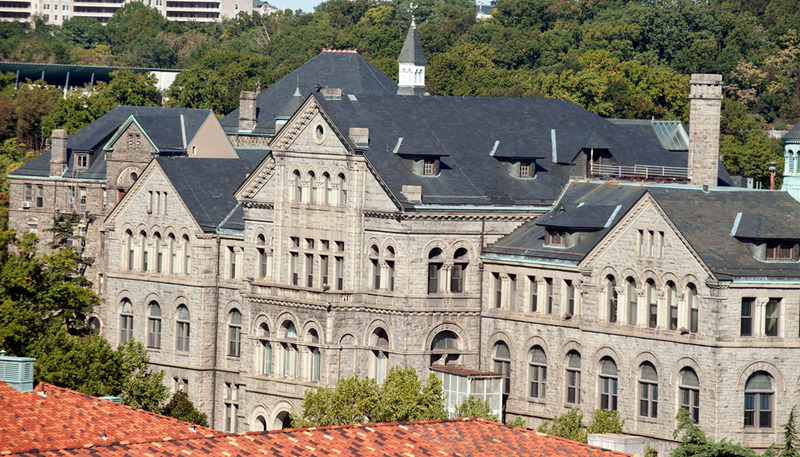 On April 10, 1887, Pope Leo XIII sent a letter to Cardinal James Gibbons, archbishop of Baltimore, giving his formal approval for the founding of The Catholic University of America, and in 1887 the University was incorporated in the District of Columbia on 66 acres of land. On May 24, 1888, the cornerstone for Caldwell Hall was laid with President Grover Cleveland as well as members of Congress and the U.S. Cabinet in attendance, and on March 7, 1889, Pope Leo XIII formally established Catholic University with his apostolic letter Magni Nobis Gaudii. Bishop John J. Keane of Richmond, Va., was appointed rector of the fledgling institution, and when the University first opened for classes in November 1889, the curriculum consisted of lectures in mental and moral philosophy, English literature, the sacred scriptures, and the various branches of theology. At the end of the second term, lectures on canon law were added. At the time, the modern American university was still in its infancy. The Johns Hopkins University in 1876 had been the first in the country to dedicate itself not only to the preservation of learning and teaching, as American institutions had been doing since the establishment of Harvard College on an English model in 1636, but also to the advancement of knowledge through research in the manner of the Prussian universities of the 19th century. Very soon the conduct of research and the training of graduate students to carry it out became the hallmarks of university status. By developing in this pattern, Catholic University became the principal channel through which the modern university movement entered the American Catholic community. In 1900, Catholic University was among the 14 institutions offering instruction for the doctorate that formed the Association of American Universities, a group of leading research institutions. In 1904 undergraduate programs were added to the offerings of the University. Today the private and coeducational university — committed to being a comprehensive Catholic and American institution of higher learning — has approximately 6,838 students – about 3,694 undergraduates and 3,144 graduate students — enrolled in 12 schools of architecture and planning, arts and sciences, business and economics, canon law, engineering, law, professional studies, music, nursing, philosophy, social service, and theology and religious studies. All of the schools offer graduate degrees and/or professional degrees. Students choose from among 72 bachelor's programs, 103 master's programs and 66 doctoral programs. The University continues to be the flagship Catholic educational institution in the United States and to maintain its unique status as the bishops' university. Under the bylaws of the University's Board of Trustees, the archbishop of Washington is ex officio the chancellor of the University. He serves as a liaison between the University and the United States Conference of Catholic Bishops, as well as between the University and the Holy See. In addition, the Board of Trustees' bylaws stipulate that of the 48 elected members of the board, 24 are clerics, of whom at least 18 are members of the U.S. bishops' conference. Catholic University is one of only three universities in the United States to have hosted the Pope on its campus and it is the only one to have done so three times — Pope John Paul II in 1979, Pope Benedict XVI in 2008, and Pope Francis in 2015. In the first two visits, the pontiff used the occasion of his visit to address educational leaders gathered from around the United States. In 2015, the Pope celebrated Mass on the East Portico of the Basilica of the National Shrine of the Immaculate Conception in front of a congregation of 30,000 people gathered on the Catholic University Mall. Since its founding, the University has been led by 15 presidents (earlier known as rectors). The current president, John Garvey, has been at the helm of the university since July 1, 2010.